Painting your home, whether inside or out was once a job left only to a professional decorator, but over the years this has changed. With the availability improving and price of decorating materials decreasing coupled with the cost of employing a professional decorator to begin with, many of us are now choosing to pick up the paintbrush ourselves not to mention getting stuck into other DIY jobs that we didn’t previously take on. The question is, are the results as good, maybe there better or they certainly could be if you read on for our 8 tips on painting like a professional. Painting over the top of cracks or flaking paint is simply a waste of time and effort, with the defects showing up again almost as soon as you've put the paintbrush down. 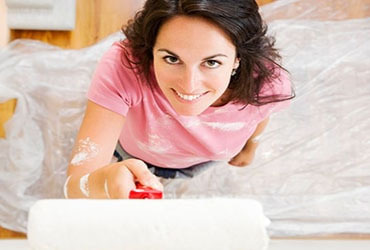 Fill the cracks and sand any areas of peeling paints before applying new paint. Similarly there’s little point to painting over grease spots or damp areas and by preparing the areas first will lead to a much more professional look and finish. Removing or loosening off your light switch, plug and any other socket covers is a few minute job that will allow you to paint behind. This also applies if painting door frames, by removing the door hinges and door handles if painting the door itself will lead to improved results. Buying the right tools for the job is essential in achieving a great finish. Quality brushes and the right roller will give you a better coverage and finish, not to mention avoiding dropped bristles in fresh paintwork. Keeping your brushes and roller covers clean is also important. Use a solvent based cleaner immediately after application, followed by a mild detergent and conditioner to keep the bristles of your brush in good condition and ready for the next job. Never leave your paintbrush or roller to soak for longer than a few minutes in solvent based cleaners. Using dustsheets to cover up floors, doors, cupboards, televisions and other furnishing protects them from drips and splashes, allowing you to focus on the job and not the cleaning. Similarly masking off areas of the floor when painting skirting boards and the same around windows and door frames while placing sandwich bags over interior door handles will keep them paint free. Although it increases the cost and time of decorating, using a separate primer will help to produce a professional finish. This is especially important when the walls are dirty, cracked or when old paint is flaking as it helps smoothen and seals the surface, preventing absorption of subsequent layers of paint. When painting walls, start by cutting in at the edges where the wall meets the ceiling and skirting board, before using a roller to apply the new paint from the top of the wall downwards. This will mean that any splashes, drips and imperfections will be covered up as you make your way down. High-end paints and the use of a quality roller and paintbrush will mean that the paint should flow onto the wall with ease. There should be no need to apply much pressure and if you’re finding such then check the condition of your roller and that your paint is suitable for the application. When applying several layers of paint, allow for each layer to dry thoroughly before applying the next. This will reduce the chance of streaks or patchy colour, whilst give you a breather and chance for a cuppa! Also keep this in mind when applying a single coat or on each layer by avoiding over painting areas that are partially dry will lead to a professional result. If you’re finding painting behind the radiator awkward then without doubt you’ll find our article on how to paint behind a radiator helpful.